This is the campaign log for the Fifteenth session of a google+run Wandering Heroes of Ogre Gate campaign. The previous session is described HERE. After they escaped from the Jade Turtle party returned to the inn to strategize. Chen and San went south to retrieve the statue of the Emerald Monk, while Bone Breaker remained at the inn. Senior Grand Councilor Cai Yuanyu met with Bone Breaker, informing him that the Face of Vaagu had been taken by Yang Tuo. He also discussed their agreement to have Huo Ju (Bone Breaker's wife) where the Heart of Yao Feng during her pregnancy so the child would become the demon emperor. Bone Breaker explained that his wife refused and the Senior Grand Councilor told him that Qinwen Master of the Seven Talismans (Leader of Heaven Palace Sect) would not budge on the point*. If Bone Breaker's son was not the embodiment of the demon emperor, then the child would die at birth. There was nothing the Senior Grand Councilor could do. Bone Breaker used his information network to find out where Yang Tuo may have gone, then he went to Heaven Palace sect with his men and some Divine Powder. He attempted to work out a new agreement. Qinwen was enraged and fused Bone Breaker's feet together. Eventually he restored Bone Breakers feet and released him when it seemed they had an understanding. However Bone Breaker used his Divine Powder to cave in the entrance to Heaven Palace sect. This only angered Qinwen even further, and suddenly Bone Breaker's left eye burned as it went blind. Qinwen told him he would take both eyes if he continued to be belligerent. When it seemed the situation was once again under control, Qinwen restored Bone Breaker's vision. San and Chen found a guide in the Banyan who took them to Mount Waxing to find the cave of the emerald monk. On the way they stopped at Wu Pen village and met a martial hero named Flying Dragon. He was with three other heroes (Master Hammer and The Saber Brothers (Mr. Yun and Mr. Xi). 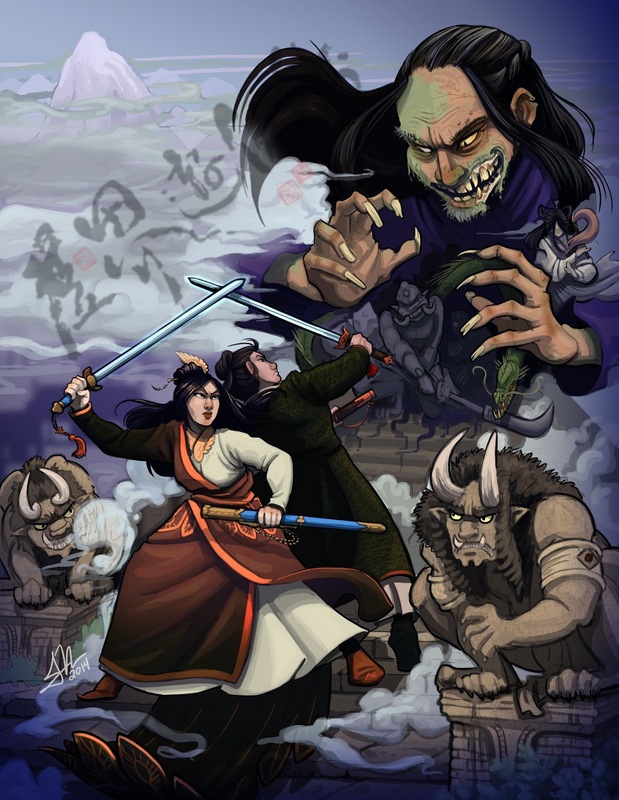 Though it seemed Flying Dragon was considering robbing them, Chen persuaded him that they could offer him and his men good employment at the Ogre Gate Inn. The next day they continued south, with Flying Dragon saying he'd go north to the inn. They reached Wuxing Mountain and began the trek up through the steep trails. They had some Flying Phantoms and soldiers with them, but were attacked by stone throwing apes called Jufu. Five of their men were incapacitated by the attack, but after they sent the apes fleeing, Chen found numinous mushrooms in the area. They found the cave of the Emerald Monk and the statue. It took some time to extract, but once they destroyed the base, they were able to carry it through the woods very slowly back to Naam. Keeping the statue covered they found a merchant willing to take them, but he insisted on seeing what their cargo was once on the ship. He took them as far as Bei and warned them to conceal the statue as others would certainly come after them if they knew what it was. When San and Chen reached Ogre Gate Inn, Bone Breaker told them he wanted to go to Sun Mai Temple. Abbot Firebrand led the way and their journey began. It tool a long time but they reached Sun Mai and abbot Yuancheng agreed to meet with Bone Breaker. During the conversation, Bone Breaker expressed a desire to change his ways and follow the path of righteousness. He promised to be merciful and sought council from the abbot. Abbot Yuancheng explained that he knew of Bone Breakers crimes and he agreed to help the son, giving him a protective amulet for Huo Ju to wear and saying as long as the child entered Sun Mai as a monk, he would be fine. He made Bone Breaker promise not to harm Yang Tuo. He told Bone Breaker that if he restored the Face of Vaagu there was a way to undo what he'd started. He revealed that the Face of Vaagu was a gateway to Infinite Sky Realm, where the immortal, Iron Sky Maiden resided. According to the Abbot she was once a member of Sun Mai (the only woman in their history) and was a devotee of Hen-Shi (Goddess of Mercy). He believed if they went to Iron Sky Realm, that the maiden would help them. The party went north, and recovered the face once they learned of Yang Tuo's whereabouts (he had taken the face to the Banyan mountains where he recruited the help of Hu Gao to protect it). Yang Tuo was pleased with Bone Breakers choice to work with Sun Mai and helped him take the face back to the Kushan Basin where they put it atop its original location. It fused to the stone with a blaze of golden light. Chen decided to remain with the Kailin in the area, while Bone Breaker, San, Huo Ju, Jade Priestess, and Abbott Firebrand used the Talisman of Yao Feng to teleport to Iron Sky Realm (this was done against the advice of Sun Mai, because the talisman violates the laws of heaven). However, use of the talisman did not attract the attention of Judge Yu (who normally handles such matters) so it seemed they were safe. They were brought into a forest and eventually made their way to a seaside village. The people were kind, thought the sky was a strange metallic blue. A fisherman told them to see Iron Sky Maiden they would first need to go to Superior Wisdom Sect near the southern peak (they soon learned that the 'peaks' were floating mountains). The sea near the village connected to Southern Peak and the fisherman agreed to take them. *In order to eliminate a reduction of Bone Breaker's lifespan to five years, the Senior Grand Councilor formed a new agreement with Heaven Palace Sect where they pledged to make Bone Breaker's child the demon emperor.